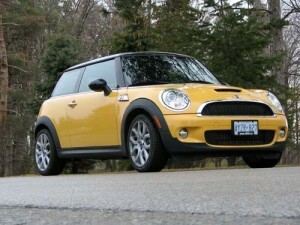 A lot of people took the time to check out the latest Mini Cooper S during my time with it. Most of them, after wandering around the car, said something along the lines of “boy, it sure doesn’t look much different.” Driving it, however, elicits a very different line. From the looks side, it almost takes parking old next to new to appreciate the subtle differences and the 60-mm stretch in overall length. The more discernable differences are found in the front and rear fascia treatments and the taller hood line – the latter is kinder to pedestrians when the worst happens because of the space between the engine and hood. It allows the needed deformation, which helps to cushion the blow. The bigger differences are found beneath the bright work – a new engine with an abundance of power leads the list. While the outgoing car was pretty quick, it really only started to shine when its supercharged engine was pushed towards the top end of the rev range. The new Cooper S uses a 1.6L turbocharged four that delivers its goods right from the word go – the nice part being that turbo lag is conspicuous by its absence. The secret to the significant boost in performance is down to three things: Direct-injection; a new twin-scroll turbocharger; and a clever twist. The first two things bring more power and a fatter, flatter power curve – 172 horsepower and 177 pound-feet of torque. It is the latter that makes the real-world difference. The old supercharged engine needed to put 4,000 rpm on the tachometer before producing its 162 lb-ft of torque; the turbocharged engine delivers all 177 lb-ft anywhere between 1,600 and 5,000 rpm. The Sport button, which remaps the throttle and sharpens the steering, helps matters enormously. The clever twist is found whenever the driver demands even more urgency. For a short period, the turbo increases its boost pressure from 11.75 to 14.7 psi. This 2-pound increase bumps the peak torque to 192-lb-ft, which gives the car a serious performance injection. It is a hoot when hauling out of a fast corner. Combine the new work ethic with a slick six-speed manual box and the Cooper S is deceptively quick – it runs from rest to 100 km/h in about 6.9 seconds, which is pretty good. In the mid-range, however, things really start to come together – the five-second 80-120-km/h sprint (in fourth gear) is strong enough to put a big smile on the driver’s face, especially when out-dragging a supposedly faster car (Porsche Boxster) through a looping on-ramp. The other reason the new Cooper S feels so fast is down to its handling – it is nothing short of amazing even as the road tightens mid-corner. What makes the handling all the more remarkable is the fact the Cooper S is a front driver. Usually, putting so much mass up front means understeer spoils the fun at an early stage. The Cooper S, especially when equipped with the optional sport package (firmer suspension, nicer wheels and 205/45R17 tires), remains flatter than gravy on a plate and neutral all the way to the ragged edge – and this in a car hog-tied by winter tires. Equip it with proper summer radials and the handling becomes even sharper. The direct steering is also razor-sharp while tracking a true line on the highway (often sharp steering equates to an unseemly wander on the highway). The large brakes follow this lead bringing short 39-metre stops from 100 km/h. There’s also a plethora of electronic helpers (everything from traction/dynamic stability control to a function that holds the Mini on a hill, which eases the hill-start process). The other thing that impresses is that the unflustered handling delivered by the sportier suspenders comes with a minimal increase in ride harshness (larger potholes do tend to filter back with a bigger jolt). Inside, the Cooper S is all Mini – toggle switches galore, an oversized speedo (it still sits mid-dash, but is considerably larger than the previous unit) and a column-mounted tachometer that houses the key warning lights. In general, it’s as user-friendly as before. The gripe is the complexity of the controls that clutter the speedo and dashboard below it. I never did become comfortable enough to operate the bulk of them when driving with enthusiasm. The saving grace is that the key audio controls (volume, mode and scrolling through the presets) are mounted on the left side of the steering wheel. The rest is pretty much as before – rear seat space is tight and getting back there requires limber limbs. Similarly, the cargo capacity is tight with the seats up, although it opens up nicely with seatbacks folded flat (it rises from 5.6 to 24 cubic feet). Dynamically, the new Mini Cooper S is a delight – it is light, tight and tenacious in a fast corner. The fact it displays such little understeer when pushed to the max underscores its go-kart-like persona. I could live without the complexity of some of the controls and would like a little more rear seat space, but when all is said and test done the new Cooper S is a lovable package, especially the new turbocharged engine. Sir Alec Issigonis, the father of the original Mini, would approve.